Astigmatism is an eye condition arising from the cornea being slightly oval shaped which affects the patient's clarity of vision and ability to focus on objects. In shortsighted and longsighted patients, the shape of the cornea results in the focal point being either in from of or behind the retina resulting in blurred vision. When patients have astigmatism there is the, possibly additional, problem that there is more than one focal point being created due to the existence of two curvature planes in the cornea. This duplication results in blurred vision which can cause squinting, eye fatigue and headaches in patients. 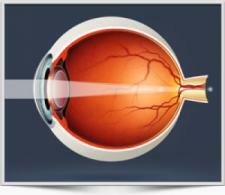 Laser eye surgery is very effective at curing astigmatism either on its own or alongside myopia and hyperopia. The cornea is reshaped to provide a single, correct curvature which results in the focal point being on the retina and restoring visual acuity.